American historical painter and poet, was born on the 5th of November 1779 at Waccamaw, South Carolina, where his father was a planter. He graduated at Harvard in 1800, and for a short time pursued his artistic studies at Charleston with Edward Greene Malbone (1777-1807) the miniature painter, and Charles Fraser (1782-1860). With the former, in 1801, he went to London, and entered the Royal Academy as a student of Benjamin West, with whom he formed a lifelong friendship. In 1804 he went to Paris, and, after a few months' residence there, to Rome, where he spent the greater part of the next four years. During this period he became intimate with Coleridge and Thorwaldsen. From 1809 to 1811 he resided in his native country, and from to 1817 he painted in England. After visiting Paris a second time, he returned to the United States, and practiced his profession at Boston (1818-1830), and afterwards at Cambridge, Massachusetts, where he died on the 9th of July 1843. In colour and the management of light and shade Allston closely imitated the Venetian school, and he has hence been styled the "American Titian." 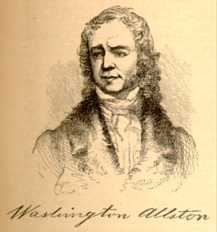 Many of his pictures have Biblical subjects, and Allston himself had a profoundly religious nature. His first considerable painting, "The Dead Man Revived," executed shortly after his second visit to England, and now at the Pennsylvania Academy of Fine Arts in Philadelphia, gained a prize of 200 guineas. In England he also painted his "St. Peter Liberated by the Angel," "Uriel in the Sun" (at Stafford House), "Jacob's Dream" (at Petworth) and "Elijah in the Wilderness." To the period of his residence in America belong "The Prophet Jeremiah" (at Yale), "Saul and the Witch of Endor", "Miriam," "Beatrice," "Rosalie," "Spalatro's Vision of the Bloody Hand," and the vast but unfinished "Belshazzar's Feast" (in the Boston Athenaeum), at which he was working at the time of his death. As a writer, Allston shows great facility of expression and imaginative power. His friend Coleridge (a portrait of whom by Allston is in the National Gallery) said of him that he was surpassed by no man of his age in artistic and poetic genius. His literary works are -- The Sylphs of the Seasons and Other Poems (1813), where he displays true sympathy with nature and deep knowledge of the human heart; Monaldi (1841), a tragical romance, the scene of which is laid in Italy; and Lectures on Art, edited by his brother-in-law, Richard Henry Dana the novelist (1850).